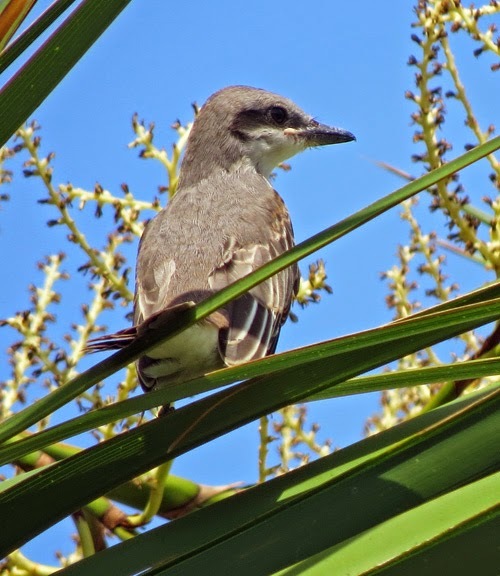 Three young gray kingbirds have fledged from the nest at the Ocean Plaza Resort on Tybee. Amazing how fast it happened. 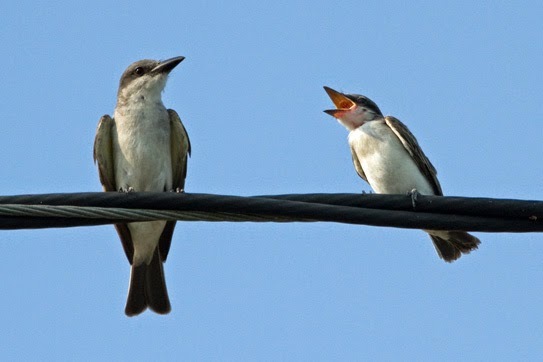 On my last kingbird post from June 17, I had photos of Mom sitting on the nest. Then on June 24th, I got a picture of a couple of fuzzy heads. Young Gray Kingbirds head poke up. On June 30, I got a not great shot of Mom at the nest to feed them. Parent comes in to feed the kids. 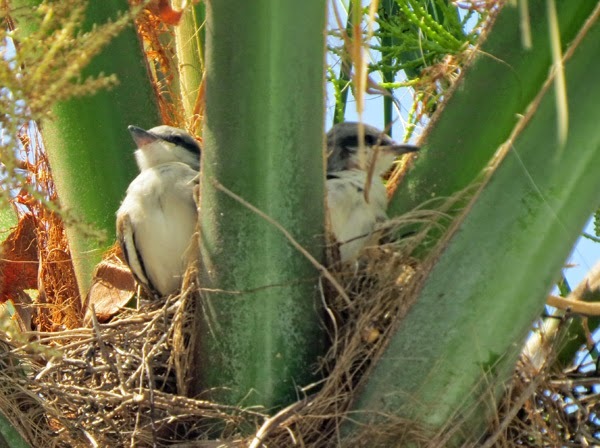 When I went back to check on the family on Monday, July 7th, there were 2 large young kingbirds in the nest. I wasn't sure at first if I was seeing a parent or the juvies. 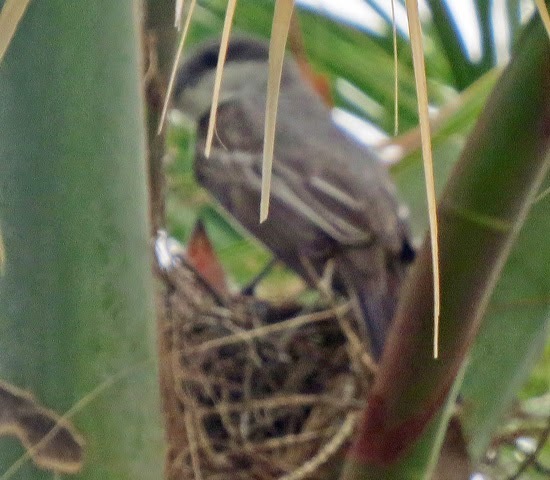 Then I heard a kingbird song from nearby and found another juvenile perched in a palm, the first to leave the nest! The first one out of the nest! Bugs Mom! Bring us Bugs! 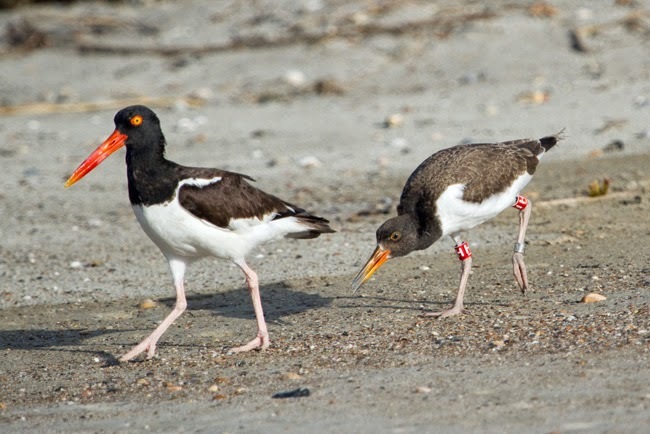 I went to the North Beach last night and as I walked towards the point, an adult American Oystercatcher flew by me carrying food. "Oh, goodie," I thought. "They are still here." 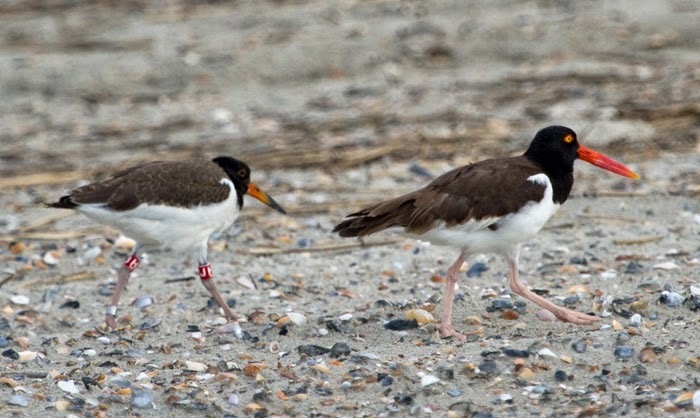 Both parents and both young adults were on the beach. HH was following one parent around while HJ was resting on the beach with the other parent nearby. HH follows the parent in begging posture. Eventually, HJ and the adult flew (yes both flew!) down the beach to join the other pair. 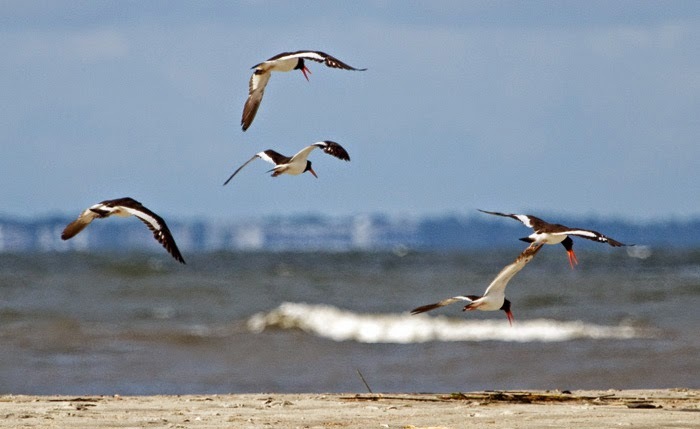 They were all together for a few minutes, before two birds - HJ and an adult - took off across the water towards Lazaretto Creek. HJ is a little larger and more mature than HH. HH & one adult remained on the beach. 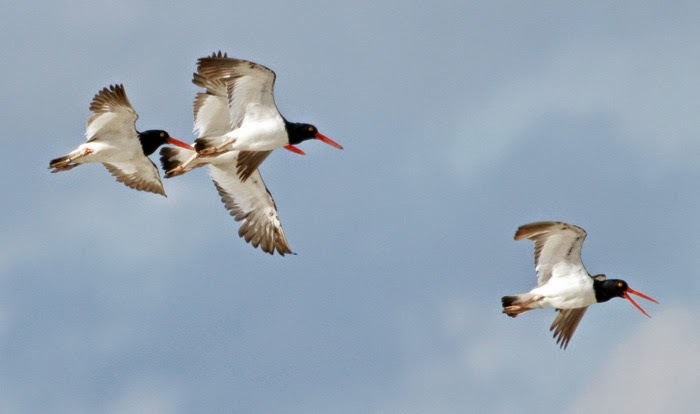 After about 10 minutes, I saw a small group of 4 American Oystercatchers fly by the point, calling loudly. As I snapped pictures, the adult from the beach joined the group and they headed around the point towards the rock jetties. They are joined by the parent from the beach. As I study my photos, I realize that one of the four has a red band. 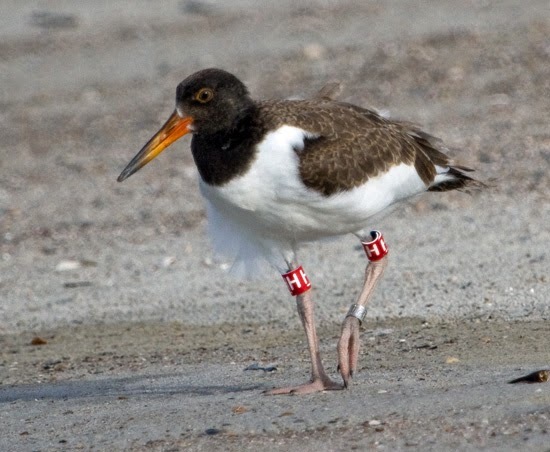 It can't be HJ because it has an all orange bill (the juvenile birds have bills that are dark on the tip) and it has a bright orange eye ring. Also, the metal band is on the right leg and HH & HJ have theirs on the left leg. This leaves HH all alone on the beach. It hunkers down for awhile, then eventually makes its way back to the rope enclosure, looking a bit forlorn. HH waits for its family to return. I wait and watch myself for more than 20 minutes. Finally, HH stands up and begins piping. As I turn around, I see an adult fly. HH immediately goes into begging mode, though the parent doesn't appear to have any food. Then another couple walks up to say that they have just seen 2 birds land further up on the beach. Sure enough, HJ and the other parent have returned. 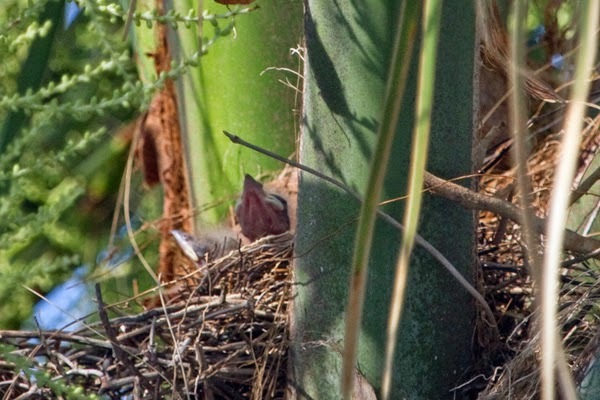 Although the chicks can now fly, they are still waiting around for Mom and Dad to bring food. HJ can fly, but it still hopefully follows the adult with a stooped, begging posture. I am delighted to be able to follow the progress of this young family.